Johan Lundskog (Middle), holding the European Trophy. Gothenburg, Sweden- Last night, Red Bull München (DEL) took on Frolunda HC (SHL) in the Champions Hockey League Finals. Frolunda HC would go on to win 3-1, winning their third European Trophy. 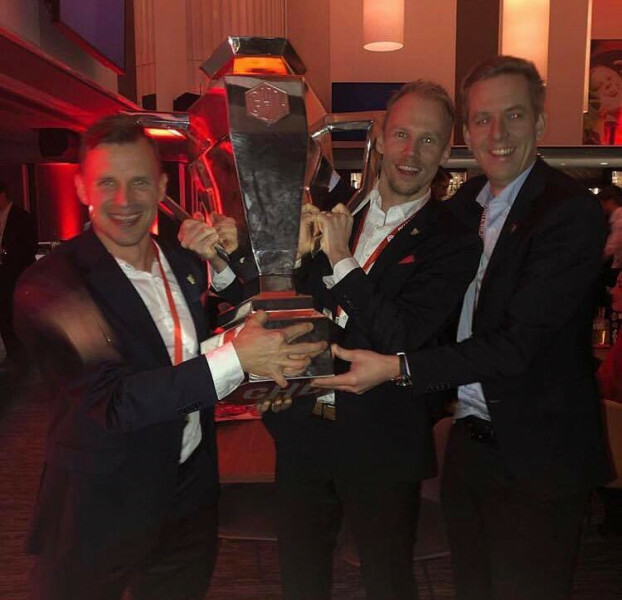 Frolunda HC has won the European Trophy the most times in Champions Hockey League history, winning it three times in 2016, 2017, and now 2019. Amongst the coaching staff for the 2017 and 2019 years has been former GM/Head Coach of the Bradford Rattlers, Johan Lundskog. Johan began his career as a player, playing for the Toronto Rattlers, which at the time was an independent touring team that went around and played different teams, including top end NCAA DI schools such as Mercyhurst University and Harvard University. Johan played for the Rattlers for three seasons between 2003-2006, as a left-handed defenceman. He was known for having an edge, as well as having an offensive touch, and in the 2005-2006 season he posted 10 Goals 22 Assists for 32 Points in 32 Games Played, while acquiring 212 Penalties in Minutes. The following year, Johan received the opportunity to try out in the ECHL, however, never ended up signing for any team. In 2006-2007, the GMHL was founded. The Bradford Rattlers were one of the seven original GMHL teams. Johan became the Assistant Coach for the Bradford Rattlers in 2006-2007, thus beginning his coaching career. The Rattlers became the first GMHL Champions in history going 37-1-4 in the regular season and then going on to win the Russell Cup. They continued their dominance going into the 2007-2008 season, going 37-4-1 and winning the Russell Cup back-to-back. The Rattlers are still the only team in the history of the GMHL to win the Russell Cup back-to-back. The Rattlers then saw a slight decline following their two Russell Cups, and while making it to the Semi-Finals in the next few seasons, they weren’t quite as dominant as they had been in their first two years. In 2009-2010, the Rattlers saw a change behind the bench, and Johan was promoted to Head Coach of the team. The Rattlers still couldn’t find their way past the Semi-Finals though, losing in the Semis in 2010, 2011, and 2012. After the 2011-2012 season, it was announced that Rattlers General Manager, Todd Miller, would be leaving to join the Barrie Colts as their Assistant Coach. The Rattlers then promoted Johan to General Manager and Head Coach going into the 2012-2013 season. Johan was eager to push the Rattlers over the hump this season and began to build a championship caliber team. The result was the most legendary season in GMHL history. Johan’s team would go on to have a perfect season, with a record of 42-0-0 in the regular season. Only three teams in the history of junior hockey have recorded a perfect season. The Rattlers would then go on to win their third Russell Cup Championship, which is the most won by a single franchise. Following up a year like that is tough, by any means, however, Johan refused to have a hangover year, and tried to build a team that would make a repeat. Although the Rattlers performance in the 2013-2014 regular season was nowhere near the level it was the year before (30-8-4), the Rattlers managed to find themselves back in the Russell Cup Finals for a second year in a row. Unfortunately, they were prevented from a back-to-back Russell Cup, losing the series 4-1 to the Bradford Bulls. In his time with the Bradford Rattlers, Johan had a record of 271-45-21, appearing in the All-Star Game as Coach (2011-2012), winning Coach of the Year (2012-2013), and winning three Russell Cups (2007, 2008, 2013). He is certainly the most decorated coach in Rattlers history and maybe even GMHL history. The following season, Johan decided to move on from the GMHL, joining IK Oskarshamn in Allsvenskan, the second tier professional league in Sweden. The team would go on to have a good season, finishing the year with a 22-21-9 record. After the 2014-2015 season, when Johan’s contract expired with IK Oskarshamn, he joined former Rattlers Coach Al Sims (2013-2014) in the ECHL with the Evansville Icemen. Johan enjoyed his season with the Icemen, and with Al Sims, however, his family had remained in Sweden, and he was looking to return to the hockey world there. In 2016-2017, after jumping around the past couple of seasons, Johan finally found a home, and was hired as the Assistant Coach for Frolunda HC, one of the most successful teams in the SHL, the top professional league in Sweden. Johan immediately found success at Frolunda HC, and they went on to win the European Trophy in the Champions Hockey League that season. The following year, in 2017-2018, while Frolunda had a bit of a quiet season by their standards, Johan had the pleasure of being the defensive coach for Rasmus Dahlin, who was the top NHL prospect, and went on to be drafted first overall in the NHL by the Buffalo Sabres. The following summer, Johan was invited by the Toronto Maple Leafs in the NHL to be a guest coach at their 2018 Development Camp. The success continued for Johan and Frolunda HC this season, when last night Frolunda HC beat Red Bull München 3-1 to win his second European Trophy and Frolunda HC’s third. Overall, Johan’s coaching career has been one filled with success, with three Russell Cup Championships at the junior level, and two European Trophies at the professional level. The GMHL is proud to have had Johan as a GM/Head Coach in our league, and we are proud to see that he is having continued success at the professional level. We wish Johan continued success in the future, and we want to congratulate him on his second European Trophy. *Updated 02/06/2019, 10:44 PM: This updated version fixes a mistake made in the previous version. The coaching staff at IK Oskarshamn was not fired and Johan was not made interim Head Coach in the 2014-2015 season. He finished the season with the team as Assistant Coach, when his contract expired he moved on to the ECHL for the 2015-2016 season.